Lucky 3 slot is from iSoftbet - a developer who has created some great slots such as the chilling Paranormal Activity slot or the Pirate inspired Skulls of Legend. The game has very basic graphics and is underlain by a tinkly piano tune with low-rate sound effects. Having started this poorly, surely Lucky 3 slot must have something going for it? Unfortunately it gets worse. The '3' in the title refers to the fact there are only 3 different symbols on the reels, Melons, Cherries and Lemons. There are 5 reels of 5 rows so we effectively play on a 5x5 grid and the symbols all appear stacked between 1 and 5 rows high. There are no Wilds and no scatters and no features and you only get 5 horizontal pay lines. I haven't finished yet; it gets worse still. The only attempt at breathing some life into this game is seen on the right hand side of the reels. Each row starting from the top has its own multiplier, 1x on the top row down to 5x at the bottom for all wins. The pays are dreadful - you pay 5 coins per spin and the Melons pay 2x bet for the 5-of-a-kind, 0.6x bet for 4 and a miserly 0.2x bet for 3. Cherries pay 3, 1 and 0.4x stake for the 5 down to 3 respectively and the top-paying symbol, the Lemon pays 5x, 2x and 1x bet. 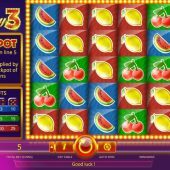 Get 5 Lemons on the bottom 5x multiplier row and instead of 25x bet you are given the slot's 'jackpot' of a 20x pay on those 5 Lemons thus awarding 100x stake. Wow.